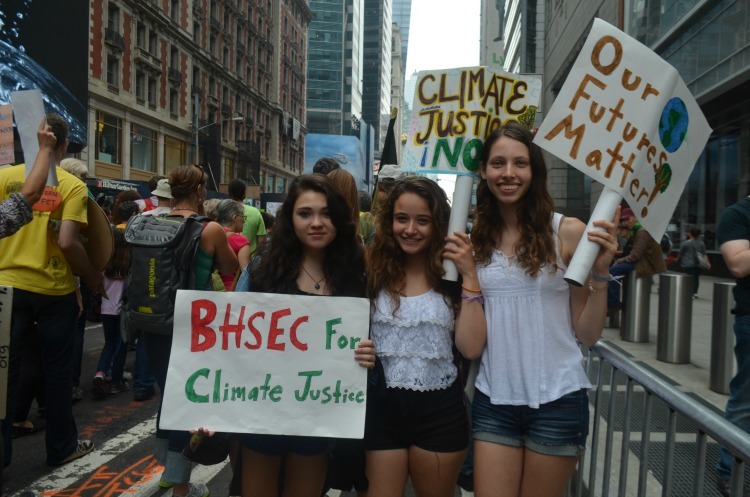 BHSEC students at the climate march. Photo credit to Kathleen Miao, ’16. 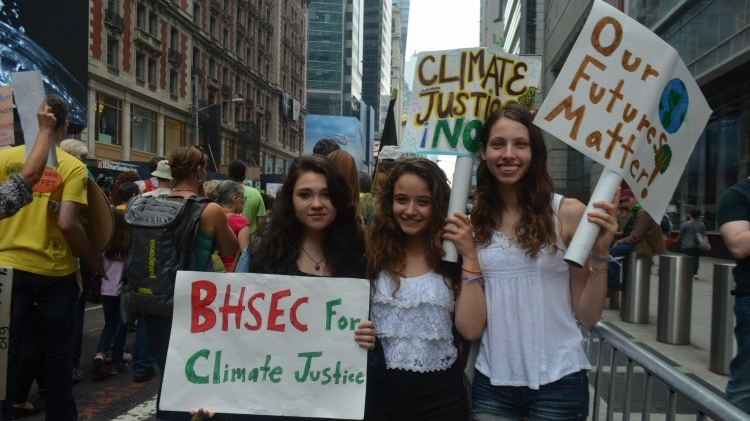 On September 21, BHSEC students and staff gathered to show their solidarity at the People’s Climate March, the biggest climate march in history. Over fifty students from all grades marched, as well as Ms. Powell, Professor Johnson, Dr. Matthews, and Ms. Walk and Dr. Hale with their families. The turnout at the march itself, an estimated 400,000 people, went beyond even the highest expectations. The streets were so crowded with passionate students, parents, and grandparents that we had to wait an hour before we actually started walking. In short, it was an enormous success. Students were struck by the diversity of the teeming crowd. People of all ages, backgrounds, and countries marched side by side, chanting and waving signs and giant puppets. “To see people from all walks of life and every corner of the earth marching together was indescribably uplifting,” said Helena Abrams, a Y1. In a single city block I saw student groups concerned about their futures, grandparents concerned about the futures of their grandchildren, doctors alarmed by the increasing number of extreme weather-related deaths, skiers frightened by the recent lack of snow, indigenous peoples, victims of hurricanes, and countless more groups. However, we were all there for one reason: we were not going to let climate change endanger what we love most. At 1:00 PM, a wave of silence swept across the crowd as we honored anyone (in other words, everyone) affected by climate change. Gazing in awe at the sea of strangers standing solemnly around me, I found the silence even more overwhelming than all of the chanting, yelling, and horn-honking that had blared in my ears just a moment ago. We ended our moment of silence with a deafening roar that seemed to shake the entire city, and continued on our way. At the end of the five-hour march, we were surprised to see a group of students from Bard College waving their banners from a window above us. We finished with sore feet, proud to have been part of a historic display of the power of ordinary people and inspired to do more. But questions remained. “I’m left wondering, what use is that energy if we have nothing to harness it towards? We can’t just march once and expect everything to be fixed; repairing our earth is a project that takes an immense amount of energy, time, and commitment,” said Emma Morgan-Bennett, a Y1. Seeing climate change finally get the attention it deserves was incredible, but the march was only the beginning. Much more must be done to protect our generation and future generations from the dangers of climate change. The next step is to turn the energy generated by the climate march into bold action. Students at BHSEC and around the city are working on harnessing this passion right now. Stay tuned for news on a new city-wide group run by and for youth who are ready to stand up for our futures.